I’ve been avoiding this sector of social networking for so long… and now I’ll have to sign up for a foursquare account. 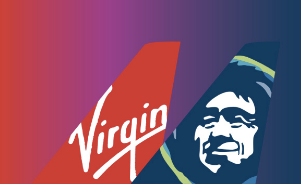 Our favorite hotel chain, Starwood (SPG) is offering 250 SPG bonus Starpoints when you check in via foursquare with a confirmed SPG reservation. The offer is from now through July 31, 2011. Click on the picture below to be linked to the SPG promotion site. 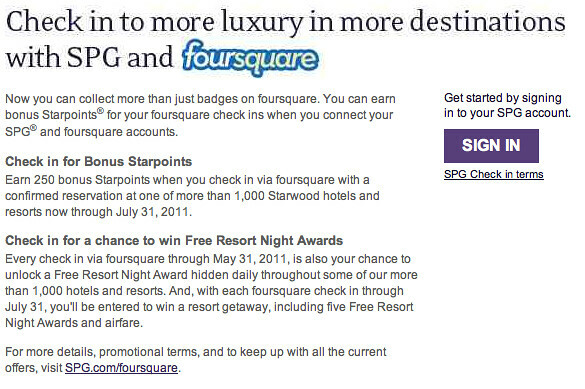 You’ll have to sign in using your SPG login then link your SPG account to your foursquare account. A heads up to anyone with rewards reservations at Planet Hollywood in Las Vegas, as of last week they are no longer part of the Starwood (SPG) brand and will refuse you at reception. No word yet on whether SPG is providing compensation to those with reservations, but it doesn’t look good. Perhaps it’s the right time for SPG to step it up and broker a deal with the Bellagio!